Cliff Barackman co-host of Finding Bigfoot and self-described track nerd. Cliff Barackman is a fountain of Bigfoot knowledge, he is especially keen on Bigfoot tracks. 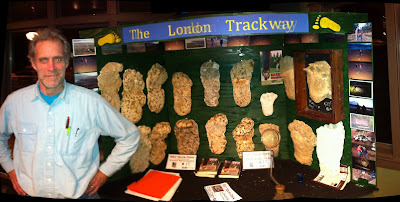 Recently he has had a break in his taping schedule and has taken the opportunity to update us with an update on his discussion of the London Trackway with Dr. Jeff Meldrum. Click the following link to read our previous London Trackway news. Below is a excerpt from Cliff Barackaman's update. While going over the casts on my very short break in April, I discovered some things that made me wonder if the impressions could have been hoaxed. The problem I found was that there seemed to be little toe splay variation from print to print. This feature (or lack thereof) might indicate a prosthetic foot, such as a wooden cutout. I later discovered that Dr. Jeff Meldrum had an opportunity to examine a small sampling of the London casts obtained by Toby Johnson, Thom Powell, and Guy Edwards at the recent Primal Peoples gathering in Washington. After seeing the casts, Dr. Meldrum also had some concerns about their authenticity. 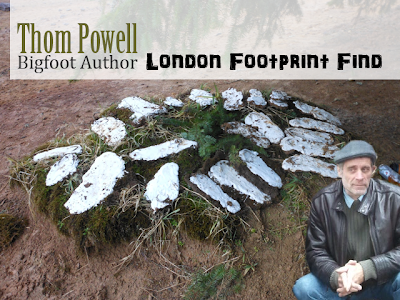 Thom Powell: Review of London Trackway Talk at Sasquatch Brewery. Author Thom Powell spoke to a crowded room at the Sasquatch Brewery last Tuesday the 20th. As you can see the restaurant/brewery temporarily became a museum for a night. Click the following link for our complete coverage of Thom Powell. Not all of the casts in the display are from the London Trackway, but take note on the five that are behind Thom's elbow. The 3rd from the left on the top row and the 2nd from the left on the second row both support a midtarsel break feature. The midtarsel break is a proposed feature of Sasquatch foot morphology. Basically it is a hinged foot as opposed to an arch like humans have. The hinged foot allows for flat prints without an arch and animated prints that exaggerate the hinge during push off. The prints behind Thom support such animation. If you have had the fortune of seeing Thom speak before you know he can capture the attention of the audience. Many of the topics he covered, last Tuesday, he had introduced over 10 years ago in the acclaimed book, The Locals. Although these topics were borderline taboo then, many of these "fringe" ideas have gained popular acceptance in the community; habituation, mind-speak, and telepathy. In his recent book, Shady Neighbors, he weaves the "new fringe" of the Sasquatch cannon, that can only best be told through allegory and fiction. Rest assured, readers will find what is in store for the next ten years of Sasquatch research in Shady Neighbors; mosquitoes, burial grounds, and curve balls. Get your very own copy of Shady Neighbors at Amazon.com, or get your signed copy of Shady Neighbors by author Thom Powell here. 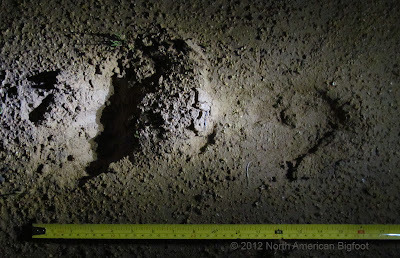 In Mid-February 120-plus tracks, possibly Bigfoot tracks, were discovered south of Eugene, Ore. These tracks have been coined, the London Tracks and were first discovered by Toby Johnson and his friend known as Tracker. You can read the brief timeline and the original report here or the extended one written by Toby himself. Toby Johnson was able to to compress the first 48 hours of the London Track discovery into 12 minutes. This is footage was taken Wednesday night FEB 15th & Thursday day FEB 16th. 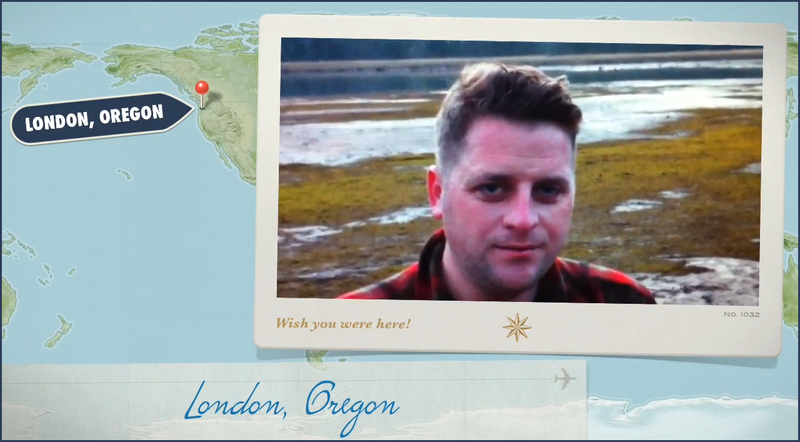 Toby Johnson sending a postcard from the past. At this point Toby, Thom, Beth and I had only 3 hours of sleep. We had been casting almost the entire night prior. This video was shot right after daybreak. I decided to record this interview for posterity's sake. This is the location four days after the initial discovery. In the interview there are two corrections that must be made. The original discoverer, Max Roy, was not walking his dog, he was approached by a man walking his dog who mentioned the prints to Max. The name of the man and his dog are unknown. The independent count that Cliff Barackman and I, Guy Edwards, came up with was 122. Toby Mentions over 160 in the video. The 160 may be other prints that were discovered nearby, Cliff and I only counted the ones in sequence. Cliff has released some great photos from his research of the London Tracks. Cliff was one of the first guys on the scene. You can read our sequence of events at our post, "Over 120 Sequential Sasquatch Prints Found South of Eugene" If you want to see great photos and specifics from Cliff Barackman's perspective then you need to head over to NorthAmericanBigfoot.com. Thom Powell, ever the author, writes one of the most gripping narratives of the events at his post titled, "The London Tracks: Where Serendipity Met Synchronicity"
Below is a slideshow compilation of most of the first photos in chronological order. The photographers are from Max Roy (first one to contact Toby about the Tracks) Toby Johnson (One of the first to discover the 120+ sequence), Cliff Barackman (The first to cast the majority of the sequence), and Thom Powell (The first person to say he got the second most casts of the sequence). South of Eugene, over 120 footprint tracks were found in a clay-mixed substrate that was a perfect material to capture and record footprints. We believe the tracks were made as recently as Saturday February 11th, although the first few prints were not discovered until Sunday the 12th. Quick run down of events. (SUN Feb 12th) Max is a retired man who once worked in the auto industry and now spends his retirement restoring cars, he happened to be looking for cars in the London, Oregon when he is approached by a man walking his dog. (MON Feb 13th) Max can't sleep, has to go back to site to take pictures. 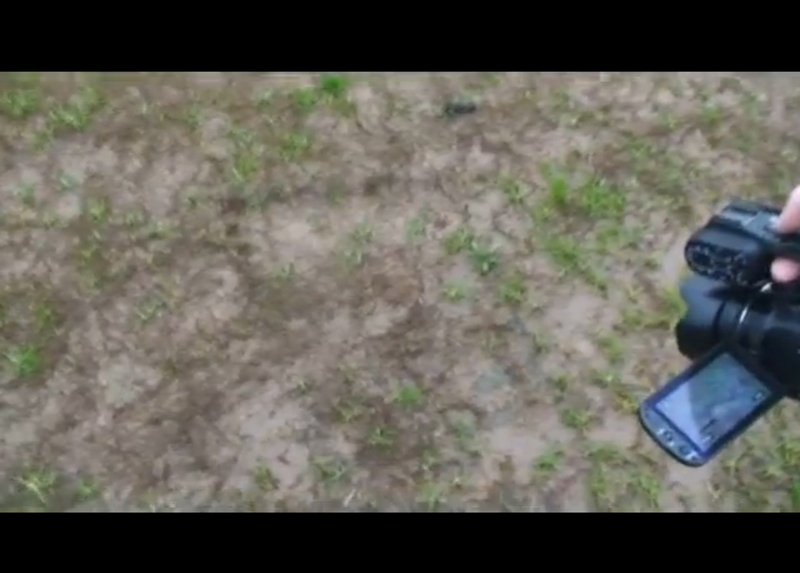 (TUE Feb 14th) Toby calls Max and max sends the pics of the three prints via phone. 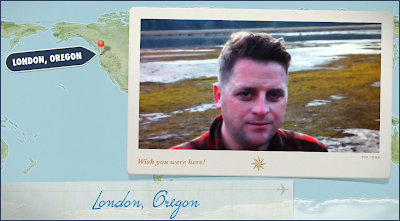 (WED Feb 14th 8:00pm ~ THURS Feb 15th 7:00am) Toby goes to the site with his friend, an avid hunter and a local. Since Toby's friend wishes to remain anonymous, we will call him Tracker. Both Toby and Tracker see the original three and few others that were not photographed, these other tracks were in heavy vegetation. (THURS Feb 15th afternoon) Toby goes home and Tracker ges home. 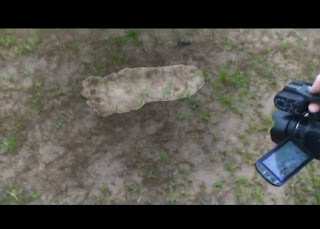 Toby tries to return to site later in afternoon, due to obligations he can not stay long, as he leaves Tracker returns. Tracker is with his daughter's boyfriend, and continues to follow the tracks on his own time. Tracker follows the tracks out of the vegetation into a clay-like substrate and realizes there are at least a hundred prints. He calls Toby. (THURS Feb 15th 3pm-ish) Toby calls Cliff Barackman, co-host of Finding Bigfoot and a self-described "track/cast-nerd". Cliff drives 2 hours to investigate the scene. Cliff also contacts Chris Minniear who picked up most of the casting material, did about half of the 65 cast made. Chris also documented the evenings events on video. (FRI Feb 16th 6pm) I am able to get a ride with Thom Powell, we meet Beth Heikkinen and Toby Johsnson and see the tracks ourselves. (SAT Feb 17th 6am) Our original count was around 118 sequential prints. 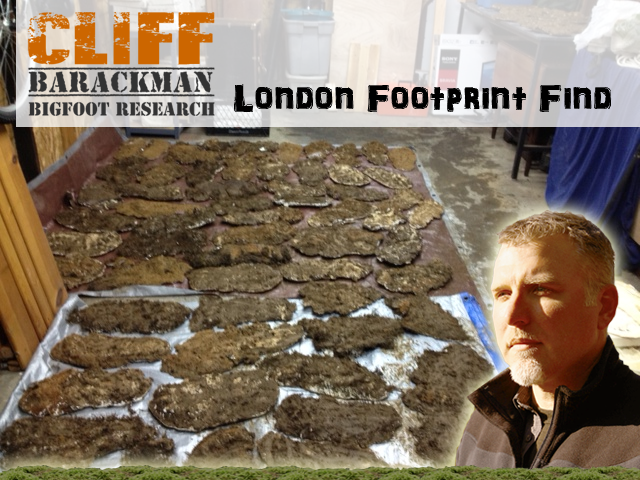 Cliff Barackman was able to count 122, we will confirm if his count are the sequential set or total prints in the area.We made two set of measurements recording step length stride length. Step length is the distance between the point of initial contact of one foot and the point of initial contact of the opposite foot. In normal gait, right and left step lengths are similar. Stride length is the distance between successive points of initial contact of the same foot. Right and left stride lengths are normally equal. 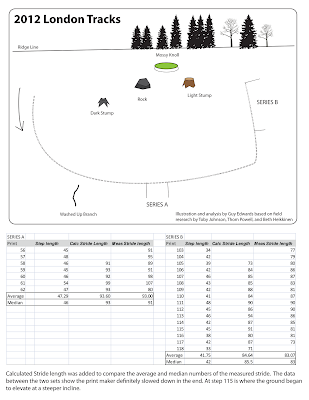 Below is a rough illustrated diagram of the the general path and the measurements we took. 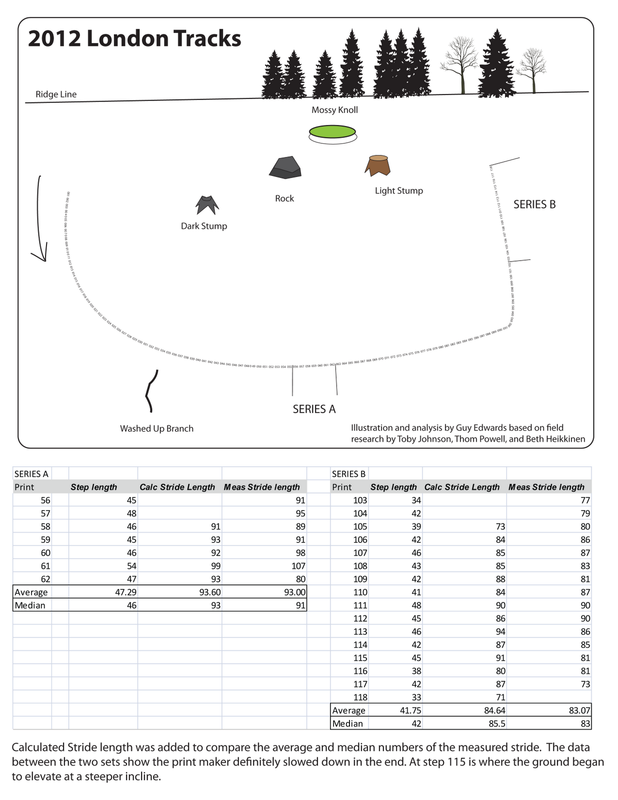 Knowing how difficult it is to get exact measurements, I added a third column titled Calculated Stride Length to compare against the Measured Stride Lengths. The numbers in the calculated column are based on the recorded step length. the numbers I am interested in are the average and means. As you can see in the two sets, Series A and Series B, there average numbers and the means for the step and stride are relatively close. 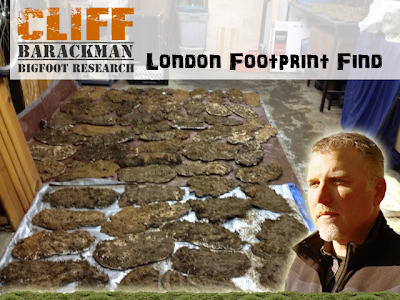 Below is a chronological slideshow of London Footprints (possible sequence of 120+ Sasquatch tracks). Photo compilation from Max Roy & Toby Johnson (initial discoverers), and Cliff Barackman & Thom Powell (first seasoned researchers on the scene) and yours truly, Guy Edwards (Bigfoot fanboy).